A sculpture of suspended, poised forms interplay with flowing pleats. 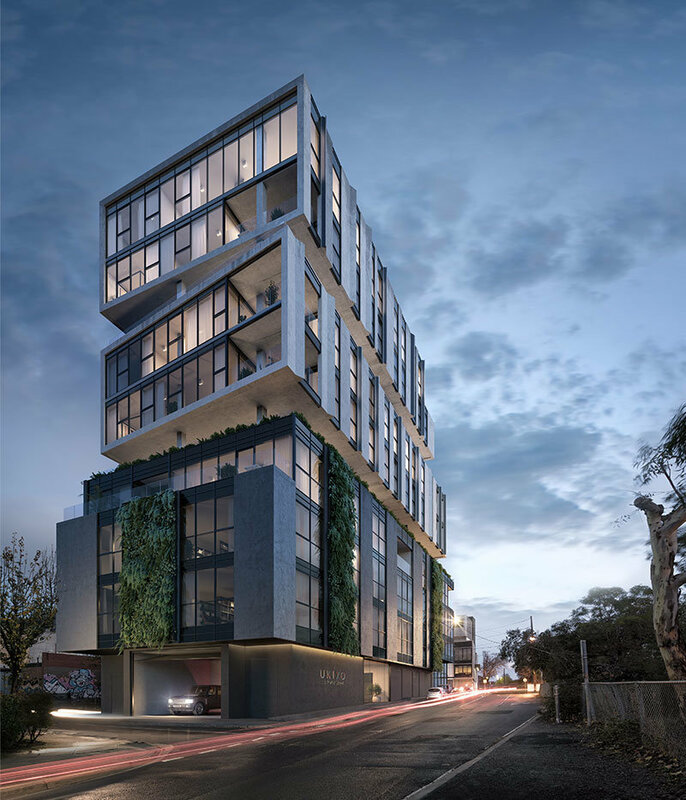 Movement and energy animates this Prahran corner, announcing the city’s newest feature. Drawn from the Japanese Ukiyo-e art movement Ukiyo creates floating worlds deeply connected to the rhythms and lifestyles of the neighbourhood. As the living walls sway and ripple in daylight, so too in night, do columns of light extend from the city below. 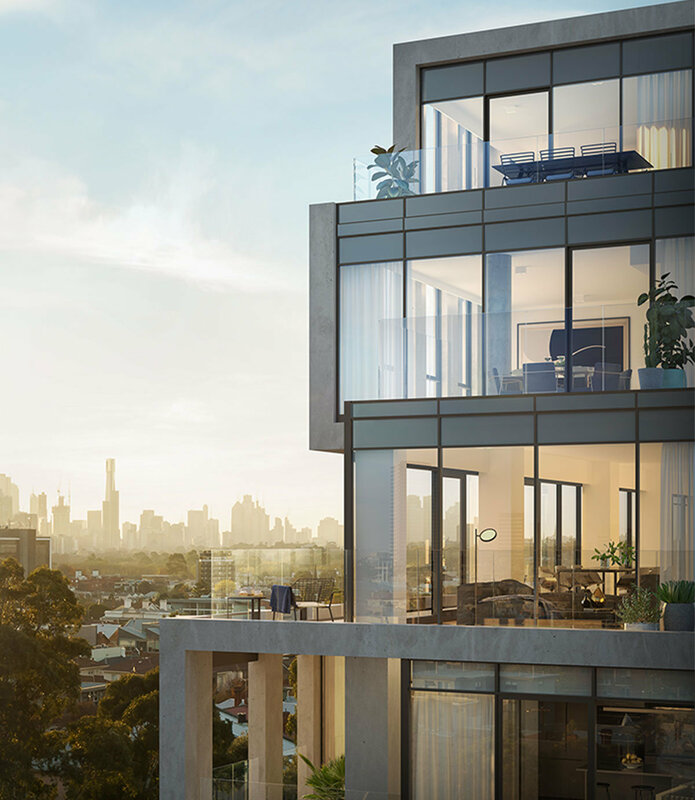 The carved qualities of Ukiyo continue to inspire wonder from various angles as a duet is created with Prahran’s skyline, space outlined in the air. 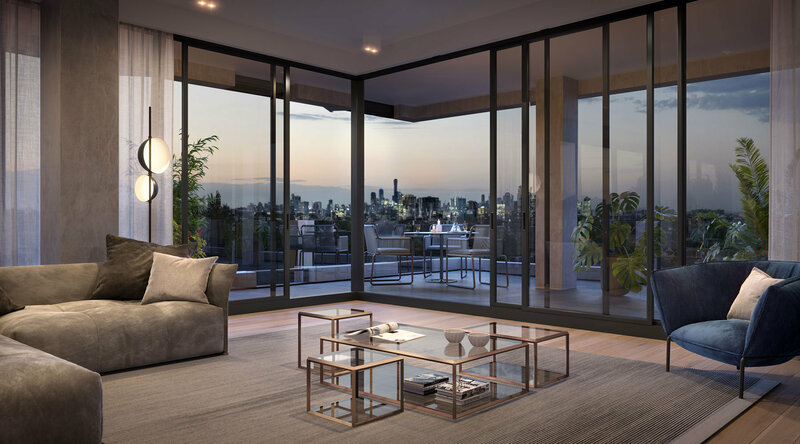 An exclusive collection of twelve, each residence carefully curated and beautifully composed to frame Melbourne in all of her glory. to the city seamlessly while light, waltzing throughout the day reveals multiple aspects to each residence. Sunrise floods this soft and natural environment over panoramic Melbourne. 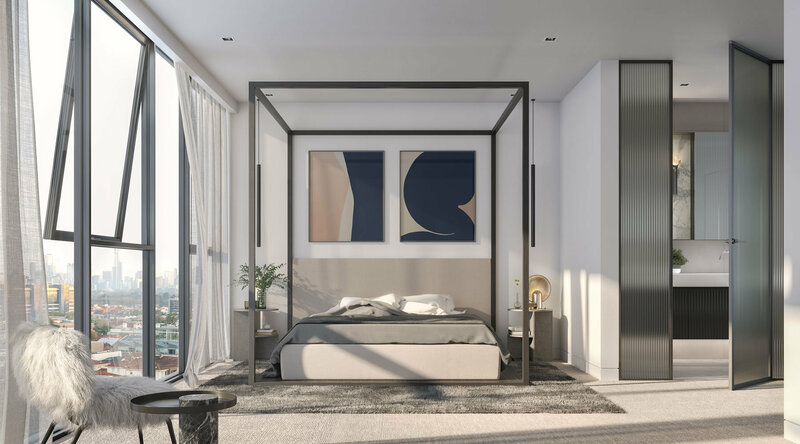 Beautiful clean black lines and fluted glass trace connection between the luxurious bed, custom detailed wardrobes and exquisite ensuite. Ample storage is intelligently integrated into a spacious and calming design. A bathroom sketched out to celebrate the ritual of bathing. 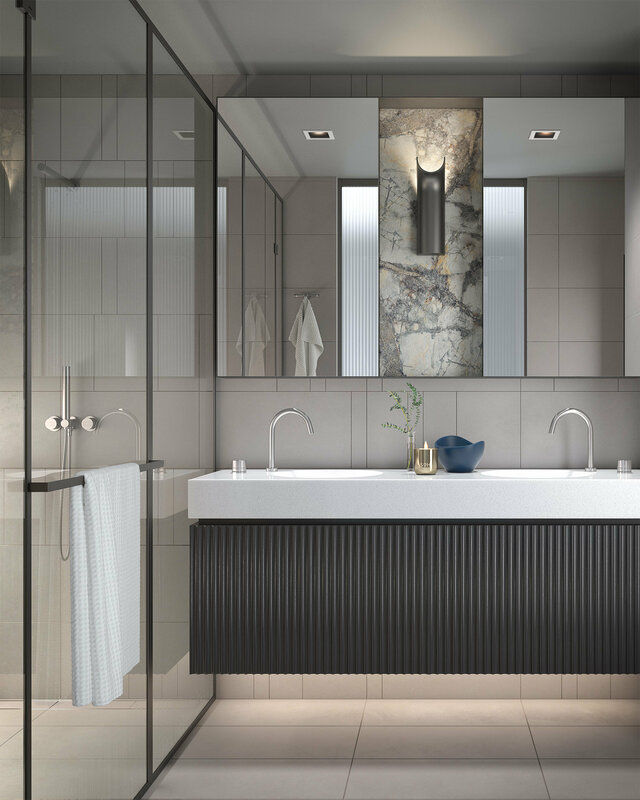 Ancient materials of stone and ceramic are custom cut to contrast with the bold, continuing black line and fluted glass that celebrate every object in this space. Simplicity allows the function and ritual to combine here. Center stage, the kitchen as a living sculpture has been imagined to combine the bold presence of an installation with supreme functionality and performance. Contrasting materials are unified by the presence of simple lines. Vertical fluted timbers meet strong horizontal black line to frame pattern and texture together. 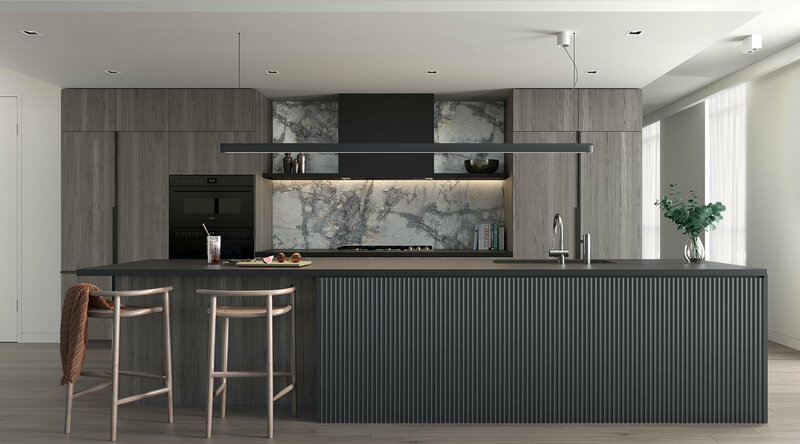 The natural stone splashback floats and contrasts against custom joinery while Wolf appliances and integrated refrigeration systems are quietly posed. In the attention to detail a kitchen has emerged that commands the eye and inspires the chef in us all. Full floors bathed in natural light from the 270° views. Expansive terraces that traverse the view with you, this is the very definiton of Ukiyo’s floating world. The great building knows when to be simple and harmonious with the grandeur of Melbourne’s world class skyline. The space provides infinite living arrangements while always inviting the view inside. 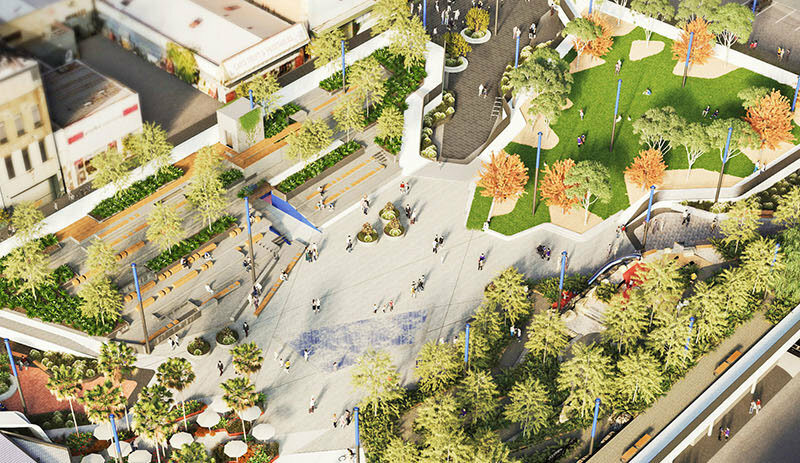 Cato Square is the $60+ million transformation of the old Cato Street car park in Prahran. When complete, the project will deliver around 10,000 square metres of multi-functional urban parkland sitting above 500+ car parking spaces. 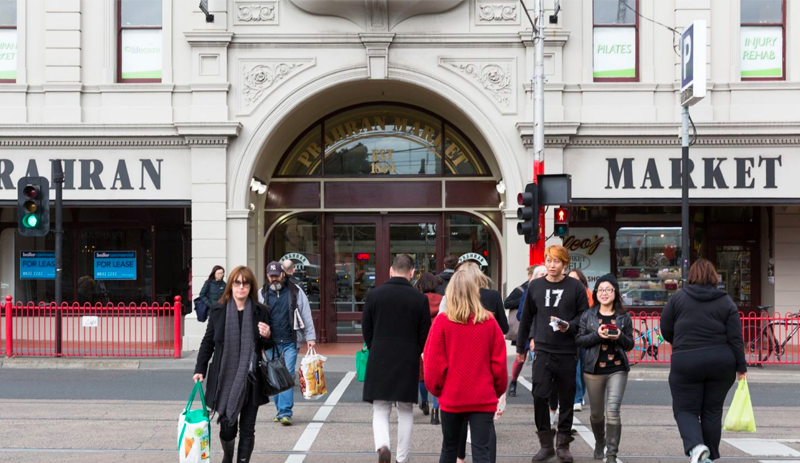 Prahran has numerous claims to fame, not least its status as one of the most linguistically divisive suburbs in Melbourne. You’ll know an outsider if they pronounce it “Pra-ran” rather than the easy shorthand of the locals rendering it as a single-syllable “Pran”. Chapter Group is founded on core principles of design excellence, outstanding quality and liveability. 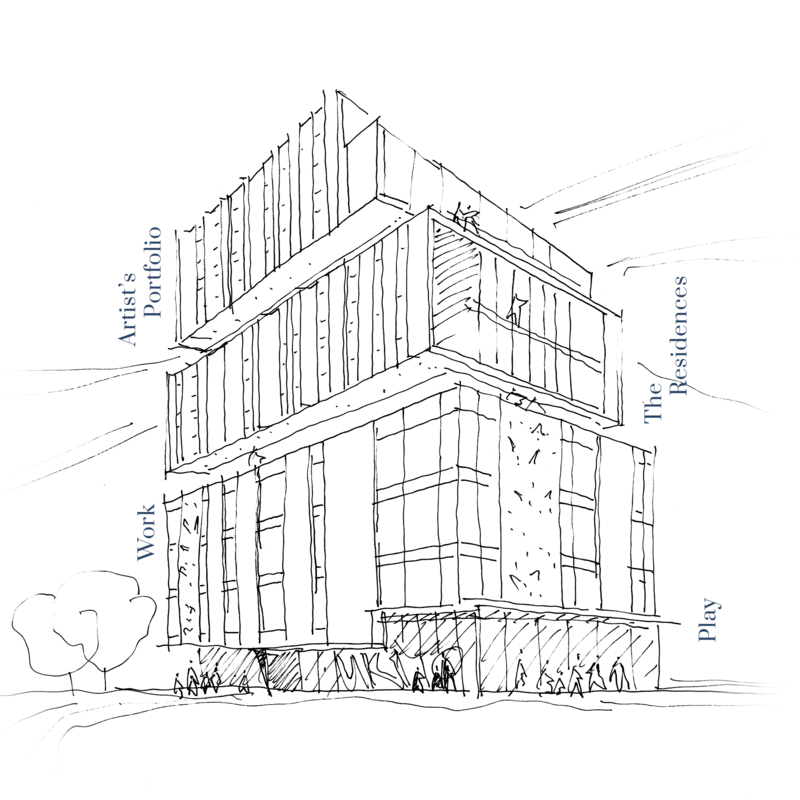 We bring together experts in key property development disciplines from architecture to finance. 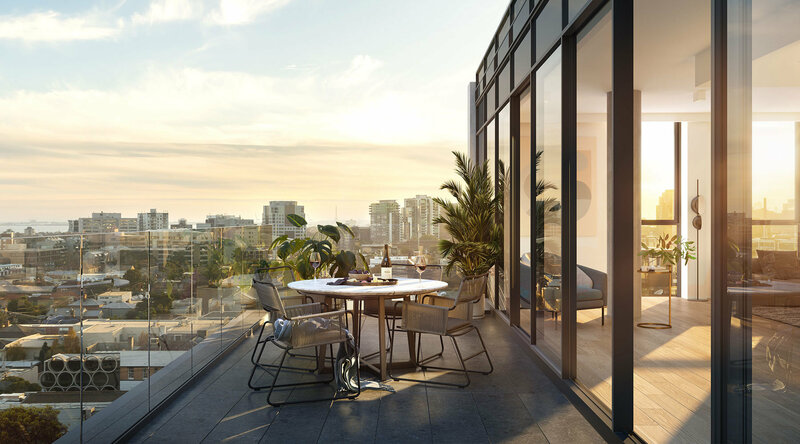 With a keen eye on exploring significant gaps in the marketplace, our portfolio of developments represent the vanguard in Melbourne’s multifamily design landscape – projects courting sophisticated clients, that take shape at the leading edge of the industry. Chapter Group derives its name from the opportunity to design homes in which people write the stories of their lives. K2LD is an International Architecture and Interior Design practice committed to delivering solutions that demonstrate beauty, design excellence and sensitivity across each of the environments we work within. 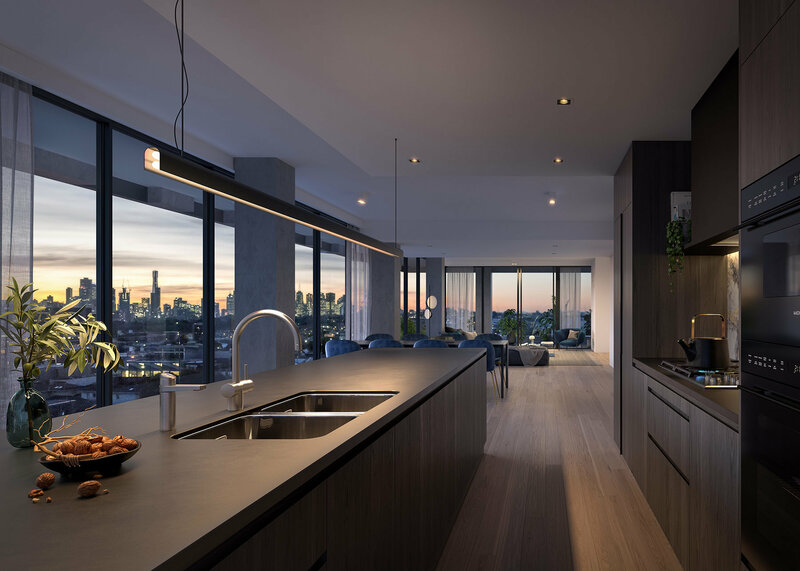 As a Practice, our team of 50+ specialists offer the personal touch of a small firm combined with the expertise of a large organisation, creating design outcomes across individual houses and multi-residential developments, through to community precincts and large scale commercial projects. 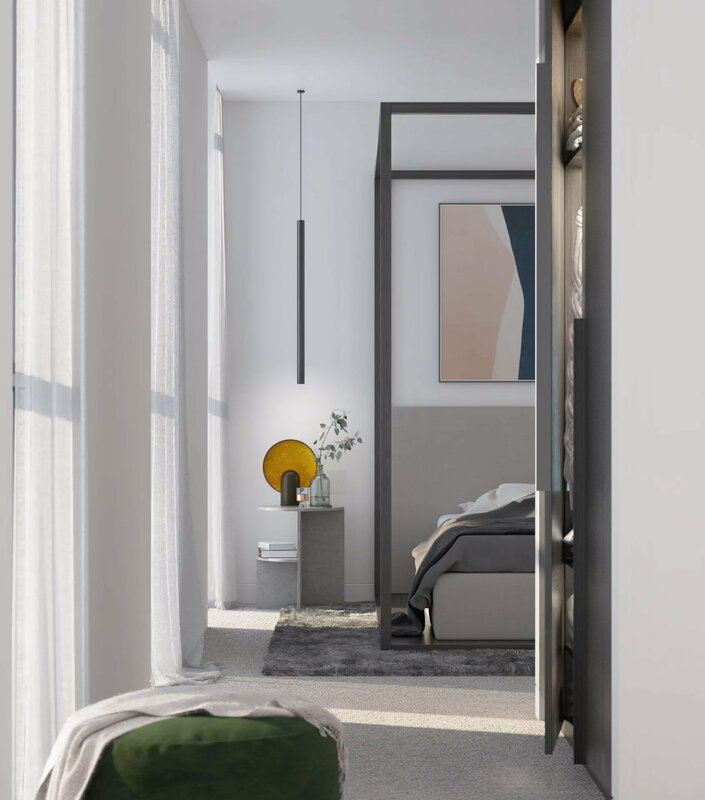 The breadth of diversity and experience in our team means that each of our project realisations are unique; our key focus being on the design journey and the establishment of ongoing relationships with our Clients. 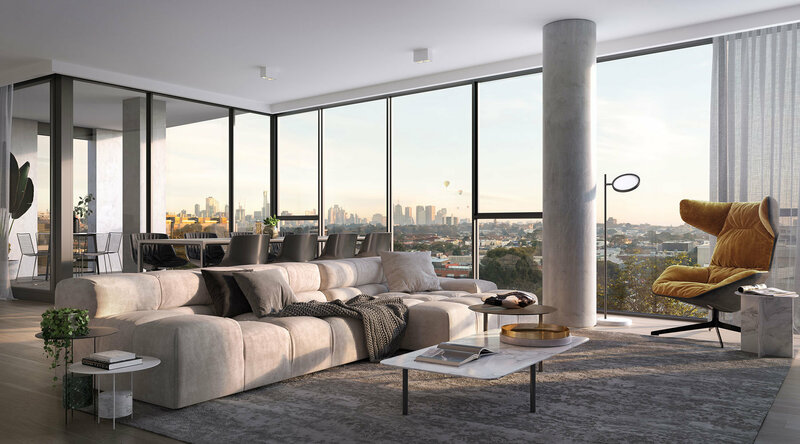 LW Development is a privately owned property holding and development company located in Melbourne, Australia, owned and controlled by the Loh and Wong families. The team’s commitment to excellence, strong financial investment and the best people in the industry reaffirms its values on delivering innovative and high quality residential and commercial property solutions. unobstructed city and bay views.